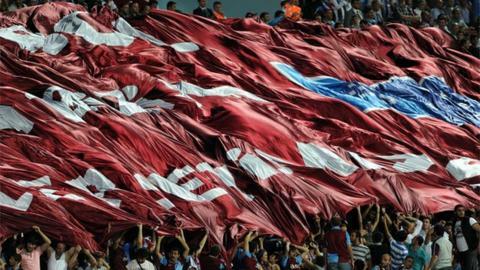 A referee was locked in the Trabzonspor stadium for several hours after making a controversial late penalty decision. Cagatay Sahan and his assistants were held on the orders of club president Ibrahim Haciosmanoglu after failing to award the hosts a late spot-kick in their 2-2 draw with Gaziantepspor. Haciosmanoglu claims he only allowed the officials to leave after a call from president Recep Tayyip Erdogan. The Turkish Football Federation has launched an investigation. An angry mob of fans had also gathered at the stadium after Sahan's decision.